Abdurrahman Wahid, born Abdurrahman Addakhil (7 September 1940 - 30 December 2009), He also called Gus Dur, was an Indonesian Muslim religious and political leader who served as the President of Indonesia from 1999 to 2001. The long-time president of the Nahdlatul Ulama and the founder of the National Awakening Party (PKB), Wahid was the first elected president of Indonesia after the resignation of Suharto in 1998. He was the president of the Non-Violence and Peace Movement, a board member of the International Strategic Dialogue Center in Israel, Interreligious for Reconciliation and Reconstruction in London, and one of the founders and board members of the Shimon Perez Center for Peace in Israel. He has been regarded by many in the world as a true defender of pluralism. 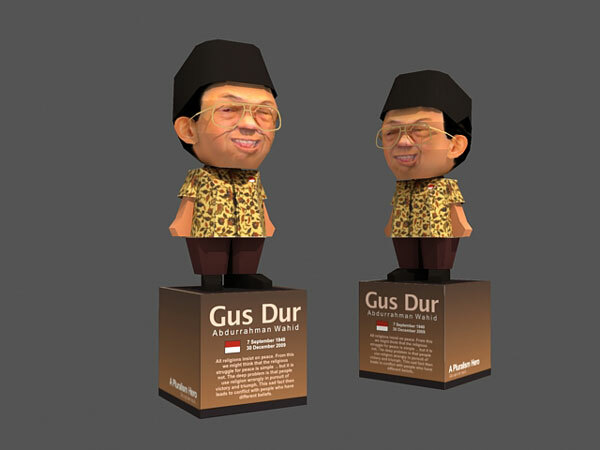 To Gus Dur, the Koran was clear in affirming religious freedom. Concerning apostasy or irtidad, he was aware of the traditional view that it be punishable by death, but warned one should not compromise the Universal Declaration of Human Rights and Indonesian contexts. To Gusdur.. You never be forgotten, you are truly a Religion Pluralism Hero, we miss you and love you. Peace on earth.